With leaves falling on the ground, it is easy to forget that mosquitoes are active in our area almost year round. Female mosquitoes lay dry eggs that require water, which activates them to hatch. Once the dry eggs get wet, a new swarm of mosquitoes can hatch and mature in a matter of days. Since mosquitoes have an affinity for warm standing water, a sunshiny day following a morning rain can trigger a new breeding cycle in any standing puddle. In less than two weeks, you have fully grown biting mosquitoes that are capable of torturing and tormenting you anytime you decide to go outdoors. Among the better-known mosquito-borne diseases are the Zika virus, malaria, West Nile virus, and encephalitis. Last month, the eighth case of West Nile virus was reported in Duval County for this year. This does not include the cases previously reported in the north Florida counties of Putnam, Clay, and Nassau as well as a case reported in Glynn County, Georgia. 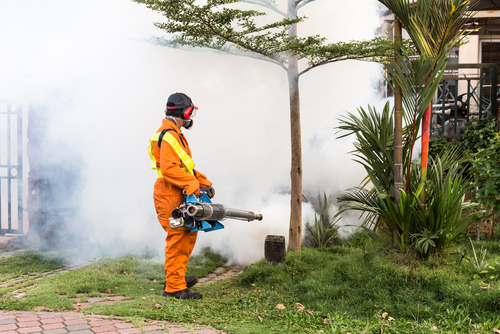 Although most people do not become sick after a bite from an infected mosquito, some will need to seek medical treatments for the short-term illness. Rarely are cases severe but mosquito-borne diseases can cause death in high-risk individuals. According to the Centers for Disease Control and Prevention (CDC), we always need to be aware of the things we can do to prevent unwanted breeding of the insects as well as take steps to protect ourselves from potentially dangerous bites. Insect repellents* should contain an EPA-registered active ingredient, such as DEET, picaridin or IR3535. You should also cover any exposed skin, including your hands, face and neck with protective clothing. Whenever possible, turn over any object that can hold rainwater, keep your ditches clean of debris, and place drain holes in any fixed object that cannot be covered. Although most cases of West Nile virus are mild and go unreported, if you or a loved develop symptoms of a mosquito-borne disease, promptly seek medical attention. Common signs of West Nile virus include fever, headache, body aches, skin rash and swollen lymph nodes that may cause a stiff neck. To see a board-certified physician today, contact either PrimeMED location for an appointment. *NOTE: Since a sunscreen is also highly recommended for all exposed areas of skin, remember to apply the sun blocker before applying any insect repellent.